There are people who have a pinky finger that turns inward toward the fourth or ring finger. Some people with this condition do have crooked bones, but the finger still appears straight like a normal finger. A crooked little finger is also known as, clinodactyly. Clinodactyly is a Greek term for "bent digit," and is used to describe a bent finger or even toe. It is actually a rare disorder, affecting 10% or less of the population. A crooked little finger can be caused by a few different things. The root cause is contractions of the tendons and ligaments that are supposed to make it straight. This can happen in the womb during development or during childhood. Another cause is actual misaligned growth plates in the bones causing abnormal bone growth. If a parent or grandparent has a crooked pinky, it may be passed on. These cases are usually seen on ultrasound during pregnancy and further genetic testing to rule out other genetic conditions can be done via amniocentesis. This is because there is speculation that a crooked finger may be a sign of another genetic condition. For the most part, a genetically linked bent pinky is benign and not related to anything else. Finger and hand injuries can break the finger bones or tear the tendons that hold them straight. The pinky is a relatively small finger and subject to more injuries than the other fingers. Things like getting fingers slammed in between something heavy, sports injuries, and even a hard fall to the ground can cause crooked fingers. If this happens during childhood, the finger may not heal correctly if the growth plates become damaged. Prompt splinting of a broken finger in children can help reduce the incidence of this happening. While it is not proven yet, there are cases of clinodactyly in certain disorders. 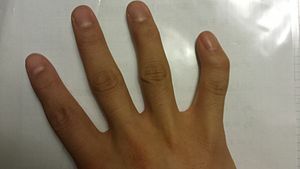 A crooked little finger can be seen in these syndromes: Down's, Mohr, Silver-Russell, Seckel, and some cases of Autism. It is actually seen in a few cases of random learning and behavior disorders. There is actually an 80% rate of bent finger in kids with Autism. Researchers are still looking into the link and some doctors are still refuting any connection. However, the amount of these syndromes with a crooked pinky is interesting. In most cases, the cause is misaligned growth plates in the finger bones. In the original formation of the bones in utero, the growth plates formed wrong. This causes the finger to grow in a crooked direction during childhood. It happens more often in boys than girls and only on one side of the body. There are rare instances where both hands are affected. Is It Serious? What Can Be Done? A crooked little finger that is mostly functional and doesn't affect use of the hand and fingers is considered mild. The majority of cases are not severe enough to be considered serious. Mild cases are only a cosmetic issue. Many people go through life with a slight bend in their little finger and live normally as others do. Doctors usually don't treat mild cases unless the bend causes a problem with grasp or pain. Also, if there is no dysfunction the surgery may be considered cosmetic by insurance and not covered. Doctors would need to document that there are issues with the finger before surgery is allowed by insurance. Rarely, there are a few cases that may have severe deformity that limits use of the fingers and/or hand. This can be serious and, if not surgically corrected, can cause permanent deformity after the growth plates have closed. Young children that have severe crooked little finger should have a very simple and easy surgery to give the growth plates stability and room for growth. This usually just involves stabilizing the growth plate by tightening the tendons and muscles. The finger will correct itself as it grows. Doctors like to use this procedure before 5 years of age. If not done before age 5, the surgery may involve altering the bones and setting a pin to stabilize the finger. This is done by cutting into the side of the finger and reshaping the bone. A pin is set into the bone to encourage straight growth. The tiny muscles and tendons may also be tightened to keep the finger straight. Once this is done, the bent finger should grow straight. Even after age 5, cutting the bone and setting the finger straight is very effective with very few kids needing a second surgery. The only issue after surgery for a crooked little finger is residual stiffness that can be worked out with physical therapy. A pinky that is slightly bent should be no cause for concern. If there is dysfunction in the hand or finger, surgery done early can help correct the deformity and restore function. Often, this condition may lead doctors to perform further evaluation for genetic or behavioral disorders. Once corrected, the finger should work fine and children can go on to live a good quality of life.